It is a well-known fact that as a person ages, the cost of life insurance coverage will also tend to rise. There are several viable reasons for this. First, one of the primary factors in the price of life insurance coverage is a person's life expectancy - and this will become shorter as one goes up in age. In addition, when a person gets older, their chances of contracting a serious illness will also likely increase. Therefore, because of this statistic, a person who is 50 or older will be seen by a life insurance company as a potentially higher risk of claim than someone who is in their 20s or 30s. Yet, due in large part to substantial advances in medical technology, people are also living a great deal longer today than at any other time in history. Therefore, this is very good news for life insurers - as well as for older consumers who need to purchase life insurance coverage, as longer life expectancies have brought the cost of this coverage down, in some cases considerably. While there are some people who may feel that those in their 50s and over may have no need for life insurance, this is not at all the case. In the past, those who were considered to be "seniors" would typically have had their mortgage and other large expenses paid off. Today, however, people who are in this age group are much more active than in past generations. Someone who is in their 50s now is much more likely to still be actively working, as well as possibly even raising children. The chances of still having a mortgage, as well as other debts, is also quite high. Should the unexpected occur, loved ones could essentially be left with heavy financial burdens such as a large mortgage balance, unpaid car loans, credit card debt, and future college expenses. Depending on the income situation, a spouse or significant other may also be left without any way to support themselves - requiring a drastic change in lifestyle. Couple all of this with the high cost of final expenses - which on average can run about $10,000 - and someone who is in their 50s has many reasons to consider the purchase of life insurance coverage. The type of life insurance that is right for a person in their 50s will generally depend on the individual's specific goals and needs. There are two primary types of life insurance that are available in the marketplace. These are term and permanent. With term insurance, death benefit only coverage can be purchased. These types of policies, as the name implies, will cover an insured for a specific period of time - or term - which will usually run for five years, ten years, 15 years, 20 years, or even 30 years. Most life insurance companies also have a one year renewable term option. 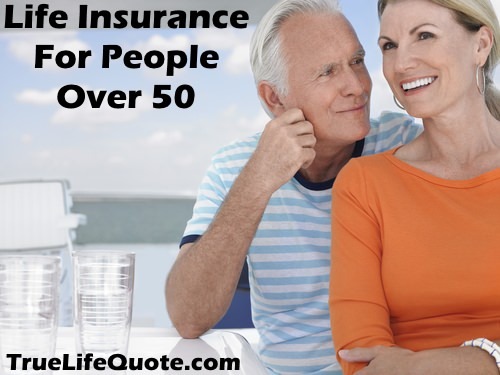 Provided that someone is in relatively good health, term life insurance can offer someone in their 50s a great way to obtain a large death benefit for a relatively low amount of premium cost. However, because these policies will expire after their time limit or term, the insured runs the risk of not being able to re-qualify if they should still want or need coverage in the future. Therefore, term life insurance may be a good option for someone in their 50s if that individual is looking for a way to cover a "temporary" need, such as the remaining time period on their mortgage balance, or the time prior to when a child or a grandchild goes off to college. For those who want more long-lasting coverage, then permanent life insurance may be the better option. Although the premium will be higher, permanent life insurance will offer both death benefit protection, as well as a cash value, or savings, component. The cash value is allowed to grow and compound on a tax-deferred basis. This means that there will be no tax due on the growth of the cash unless or until it is withdrawn by the policyholder. These funds can be a great way to save for additional needs, such as supplementing future retirement income or paying off debts. They can also provide an additional vehicle for someone who is in their 50s with a way to add more tax-deferred savings if they have already maxed-out their other qualified retirement plans such as their employer-sponsored 401(k) and / or Traditional IRA account, as these life insurance policies typically have no annual contribution limits. Permanent life insurance policies will also generally have a guaranteed premium amount. This means that once the individual is approved for coverage, the life insurance company cannot increase the amount of premium - regardless of the insured's increasing age, or whether the individual contracts an adverse health condition and becomes uninsurable in the future. In fact, the only way that these types of policies can be cancelled by the insurer is due to non-payment of premiums. The type and amount of coverage that is ultimately chosen by an individual will certainly depend on a person's specific needs and goals. In deciding this, having the assistance of an insurance expert can be helpful. Oftentimes, it is best to work with an agency that is not affiliated with just one insurer. That way, you can obtain a more unbiased look at multiple policies, benefits, and premium quotes that are available to you - and from there determine the very best fit. The cost of life insurance coverage for someone who is in their 50s will also be dependent on several factors. These will include the amount of coverage that you purchase, as well as the type of policy that you choose. Other factors will include your age, gender, and overall health condition. If you are in what the insurance company deems to be average health for an insured who is in their 50s, and you are a non-smoker, then it is likely that you may qualify for a Standard policy rating. This means that you will pay a premium amount that is charged to other insureds who are also of your same age and health category. If, however, your health is somewhat below average - yet, not poor enough to be declined for coverage altogether - then it is likely that you may be offered a substandard policy classification. This means that you would pay slightly more in premium cost than those who are in the Standard class for your coverage. It is important to understand that not all life insurance companies underwrite their applicants for coverage in the exact same manner. Therefore, someone who is in their 50s and in excellent health who applies at one company may be offered a preferred policy class, whereas they may only be offered a Standard policy class at another insurer. With that in mind, it pays to shop around prior to making your decision. Working with a company or an agency that has access to more than just one insurer can easily assist you with which direction to go when applying for the right type of coverage. If you are in your 50s, and you are looking for new or additional senior life insurance coverage, we can help. We work with many of the top life insurance carriers in the industry, and we can assist you in getting all of the important information that you need. We can do so for you quickly and easily - and without the need to even meet in person with a life insurance agent. When you are ready to move forward, fill out the quote form on this page. Should you find that you need any additional information on finding the right life insurance for those who are in their 50s - or even if you just happen to have a question about life insurance in general - please feel free to contact us directly. Our experts will be happy to discuss with you any of the details that you need. We can be reached via phone, toll-free, by dialing 877-235-9299. We understand that looking for the right life insurance may seem to be a bit daunting - especially if you are in your 50s. The fear of not qualifying due to age or health can be a big concern. But the good news is that the cost of life insurance has come down considerably over the past several years - meaning that you can obtain the coverage that you need at an affordable price that you may not have expected. We can help you to get that protection and ensure that you and your loved ones have the peace of mind that you deserve. So, contact us today - we're here to help.